We've learned how the oxygenated blood leaves the heart at the ascending aorta, then at the aortic arch it branches off to the carotid artery and subclavian artery. After the aortic arch, the aorta turns downward and that is called the descending aorta. Missouri is in the midwest part of the US. It's nickname is The Show Me State, and it's motto is Salus populi suprema lex esto which is Latin for The health of the people should be the supreme law. 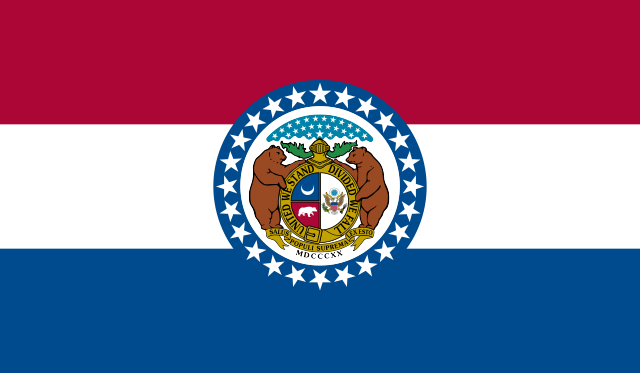 The flag of Missouri has red white and blue stripes. The red is for valor, white for purity, blue for justice. The red white and blue are also because there were a lot of French people in Missouri long ago, and the French flag is red white and blue. The state seal is in the middle, and it has a bear for bravery, a crescent moon for the new and growing state and two grizzly bears. There is a helmet above the seal with 1 big star and 23 small stars because Missouri was the 24th state. The gateway arch is in St. Louis Missouri. It is the tallest arch in the world and was built to honor Missouri. The Pony Express was a way for people to deliver mail all across the country by people riding horses really fast. The trail started in Missouri, and went all the way over to Sacramento, California. It took about 10 days for a package to get all the way across the country on the Pony Express. The 33rd president of the United States Harry S. Truman was born in Missouri. 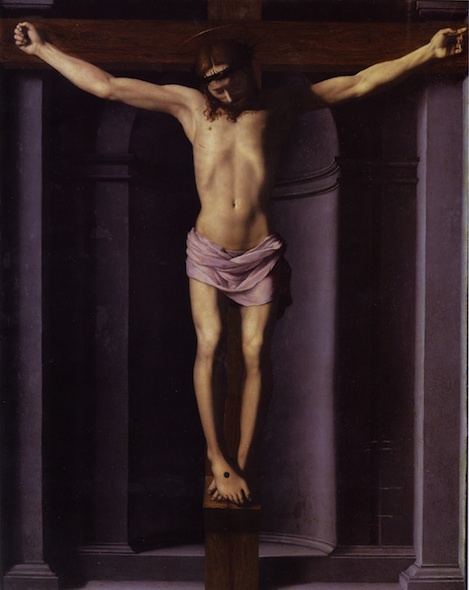 Jesus Crucificion - Why have you forsaken me? When Jesus had been on the cross a long time, he was almost ready to die. He cried out My God, my God, why have you forsaken me? Jesus was going to die while carrying the sin of the whole world with him. In the book of Psalms, King David had written a song that began like that, and then goes on to talk about being in pain and suffering, but then being delivered by God and praising God as he rules over all the nations. Jesus talked a lot about things that prophets said were going to happen, and many times told people that he was proof that some of the prophecies were coming true. Psalms were poetry and songs that were written mostly by King David about 1,000 years before Jesus came along. Psalm #22 in the book of Psalms starts off with: "My God, my God, why have you forsaken me?" which is exactly what Jesus said. He knew every word of every Psalm. The Psalm goes on to say: "a pack of villains encircles me; they pierce my hands and my feet. They divide my clothes among them and cast lots for my garment." Jesus was on the cross with his hands and feet pierced, and the solders had divided up his clothes and cast lots for them. It goes on at the end to tell how the Lord will rule over the nations, and ends with: "They will proclaim his righteousness, declaring to a people yet unborn: He has done it!" Jesus talked in parables a lot, and did things that were part of fulfilling the prophecies of the prophets from long ago. King David's Psalm was written over 1,000 years before Jesus came along, but on the cross he was still fulfilling the prophecy, and even said the first line of the Psalm that talked about what was happening. We just learned about the famous painting No. 5, 1948 by Jackson Pollock. Another famous painting is Charles IV of Spain and His Family by Spanish painter Francisco Goya in 1801. Goya became a famous painter in Spain and the royal family liked his art so much they hired him to do some family portraits. The painting of Charles IV and his family is interesting because many people believed that his wife Louisa was really in charge, so Goya painted her to be in the middle of the painting. He also painted them in very fancy expensive clothing, to show how rich they were. The lighting in the painting shows that although the family is in light right now, there is a dark shadow coming toward them. Many people were not happy with the kings and queens, so that is why Goya painted them with the queen in the middle, wearing rich and fancy clothes that no one else could afford, and a shadow coming toward them meaning they would not be kings and queens for much longer. Goya also painted himself in the painting in the back left in the dark, standing at an easel. We just learned that in German to say this chair is small you say Der Stuhl ist klein. To say My drink is cold, we say Mein Getränk ist kalt. So all together Mein Getränk ist kalt sounds like mine geh-trank isst kah-lt. Some clouds only come around during big storms. One of these types of clouds is called a shelf cloud. Usually when you see a shelf cloud, it is a low sideways wedge cloud right at the edge of a thunderstorm. The upper part looks like a rising cloud, and the bottom part looks like a wild windy blowing storm. We just learned about the Shar Pei. Another type of dog is the Shiba Inu. The Shiba Inu is a type of dog that started out in Japan. The word Inu means dog, and the word Shiba either means little or brushwood, which is a type of wood that whose leaves turn red like the dog's coat. Sometimes the Shiba Inu is called the little brushwood dog. The Shiba Inu are very clean dogs, and almost like a cat they will sometimes like their fur clean! They sometimes make a sound called the shiba scream, which is like a very high pitched scream. They can make this sound if they are very happy, or if they don't like the way someone is petting them. Mississippi is a state in the south of the US, with the Atlantic ocean to the south. It's nicknames are The Magnolia State and The Hospitality State. It's motto is Virtute et Armis which means By valor and arms. The flag of Mississippi has red white and blue stripes, and it has the confederate flag in the top left corner. It's the only state in the US that has the confederate flag on it. There are a bunch of islands off the coast of Mississippi and Florida, called the gulf islands because they are right on the gulf of Mexico. The biggest one by Mississippi is Horn Island. On one of the gulf islands called West Ship island, there is a military fort called fort Massachusetts, built in the 1800s to protect America from attacking ships. When Jesus was on the cross, he looked down and saw his mother Mary, and also his disciple John. He said to them Woman, here is your son and Here is your mother. Even though Jesus was dying on the cross, he was thinking about who would take care of his mother when he was gone, so he told his disciple to take care of his mother when he was gone. We just learned about the painting Little Dancer of Fourteen Years - by Edgar Degas. Another famous work of art is No. 5, 1948 by American Painter Jackson Pollock. This painting used something called drip painting which meant the painters canvas was on the ground and he used liquid paint to drip onto the canvas. Sometimes he would try and drip lines. The painting is very different from some other styles because it's not a simple picture of people, it's kind of a bunch of wild and crazy lines and curves all over the place. This is a style called abstract expressionism, and it mostly means that the painting shows a lot of energy and feeling but usually isn't just a picture of something. We just learned that in German to say this house is big you say Das Haus ist groß. So all together Der Stuhl ist klein sounds like day-rr shtool isst klah-een. Clouds are sometimes grouped by what is called their étage, which is really just a fancy word for how high or low a cloud is in the sky. There are high-étage, middle-étage and low-étage. The high étage is way up high in the sky, 10,000 to 25,000 feet up! The low étage is 6,500 feet or below, and the middle étage is right in between. So the clouds in the different étages are called different things, just based on how high they are in the sky. Like the cirrocumulus clouds are high-étage, the altocumulus are middle-étage and the stratocumulus are low-étage. We just learned about the Siberian Husky. Another type of dog is the Shar Pei. The Shar Pei has very loose skin all over it's body as a puppy. As it grows older, the skin stretches out a little, but it is still very loose especially on the their face. These dogs were used as farming, hunting and fighting dogs, because if whatever animal they were fighting got a hold on their skin they could stretch their skin out to turn around and bite them back. Minnesota is a state in the midwest part of the US, that borders Canada to the north and Lake Superior on the northeast. It's name comes from Native American words meaning blue water. It's nicknames are the Land of 10,000 Lakes, North Star State and The Gopher State. It's motto is L'Étoile du Nord, which is French for The Star of the North. 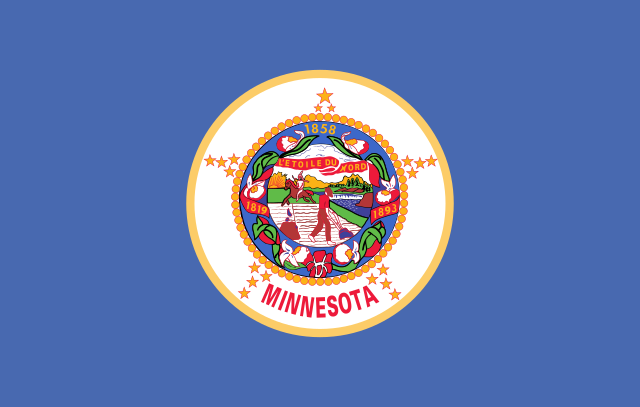 The state flag of Minnesota has the state seal on it, which shows a Native American riding a horse and a pioneer using a plow on his field. The Mississippi river and a waterfall called St. Anthony falls are shown, and three pine trees. The shopping mall with the most stores in the US is in Minnesota, called the mall of America. It has over 500 stores inside, and even an amusement park in the middle! There are two cities right next to each other in Minnesota, divided by the Mississippi river and people call them the Twin Cities of Minneapolis and Saint Paul. The Mississippi river starts in Minnesota, coming from Lake Itasca, and then turning into a river at Saint Anthony Falls, where the twin cities use the waterfall to make power for the city. Every year in Saint Paul they have a big winter carnival, and sometimes they even build a giant ice palace. When Jesus was being put up on the cross, he said Father, forgive them, for they do not know what they are doing. God sent Jesus into the world to die on the cross for everyone's sins. It was all part of God's plan, and the people who were crucifying Jesus were just soldiers and workers and didn't know he was the son of God. With all of the power that Jesus had he could have walked down off the cross but didn't, instead he asked God the Father to not destroy the world for what they were doing because it was all part of his plan. In that way it showed us how much he loved the world because he went through the suffering to save us. We just learned about the work of art The Snail - By Henri Matisse. Another famous work of art is a sculpture called Little Dancer of Fourteen Years made by French Edgar Degas in 1881 in Paris. Degas was famous for making paintings, sculptures, prints, and drawings. Many of his paintings were about ballet dancers, and this statue is of a young girl who was a ballet student in Paris. The statue is made of wax, and has a real shirt, tutu and slippers, and even has a wig made of real hair. When he made the statue, he started off with some lead pipes all connected together to act like a skeleton so he could make the wax body and it wouldn't fall apart. A metal skeleton like the one he made is called an armature. Some people looked at the little girl and thought she was uncomfortable trying to put her body in the right ballet pose, and others thought she looked beautiful because she was a young girl trying to be the best dancer she could. To say this house is big in German you say Das Haus ist groß. So all together Das Haus ist groß sounds like Zee zint ow-f-guh-raykt. We've learned about many types of clouds already! Another type of cloud is called the stratocumulus cloud. Stratocumulus clouds are large dark and round, usually in groups or waves, and they are lower in the sky. In the cold polar oceans there are many very large stratocumulus clouds. They look very similar to altocumulus, but much larger sized groups. We just learned about the Basset Hound. Another type of dog is the Siberian Husky. 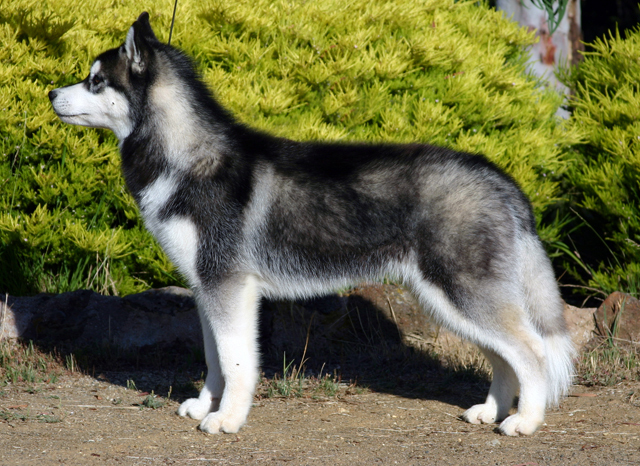 The husky was a dog used by the Inuit people who live in Alaska and Siberia, who were once called Eskimos. Some people think the name husky came from esky which was a nickname for eskimos. Huskies were used as sled dogs in Alaska when people were looking there for gold. The dogs have lots of energy and can survive temperatures colder than -70 degrees! Unlike most dogs, some huskies have blue eyes! Huskies have two types of fur, they have a short coat of fur that stays close to their body, and a longer coat of fur that goes on top of the first one. This is like wearing two fur coats so it keeps them nice and warm. Huskies have a curved tail, and when they lay down they can curl their nose right into their tail to keep warm. Some people call this the "Siberian Swirl". We know that the subclavian artery in the chest goes to the axillary artery in the armpit and then the brachial artery in the upper arm. After that it goes further down the arm, and splits into two arteries: the ulnar and radial arteries. These arteries go right along the radius and ulna bones in the forearm. The radial artery is the one that ends up at your wrist right by your thumb, where you can feel your pulse. 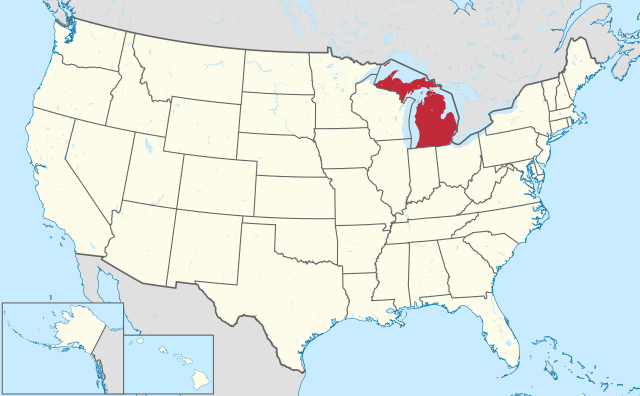 Michigan is a state in the midwest of the US, bordering Canada to the north. The state of Michigan is split up into two pieces of land, the Upper Peninsula and the Lower Peninsula. A peninsula is a piece of land that is surrounded by water on 3 sides. The two peninsulas are connected by a long bridge called the Mackinac Bridge. People that live in the Upper Peninsula are sometimes called yoopers because when you say the letters U and P it sounds kind of like Yoop. The state mottos are: Si quaeris peninsulam amoenam circumspice, which means If you seek a pleasant peninsula, look about you. The Michigan flag is dark blue, and has the words E Pluribus Unum which means Out of many, one. it says Tuebor, which means I will defend, and it also says Si Quæris Peninsulam Amœnam Circumspice, which means If you seek a pleasant peninsula, look about you. 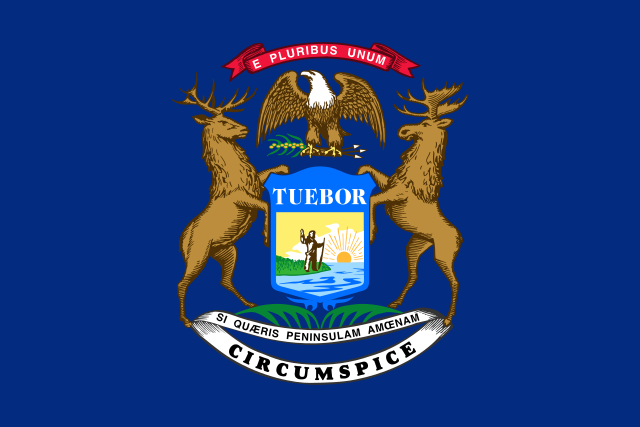 There is a moose an elk and an eagle on the state crest, and in the middle is a man standing on the edge of water holding a rifle, meaning that he will defend Michigan from invaders. Michigan has the largest bunch of fresh water lakes in the world, with the 4 lakes that it borders: Lake Superior, Lake Michigan, Lake Huron and Lake Erie. 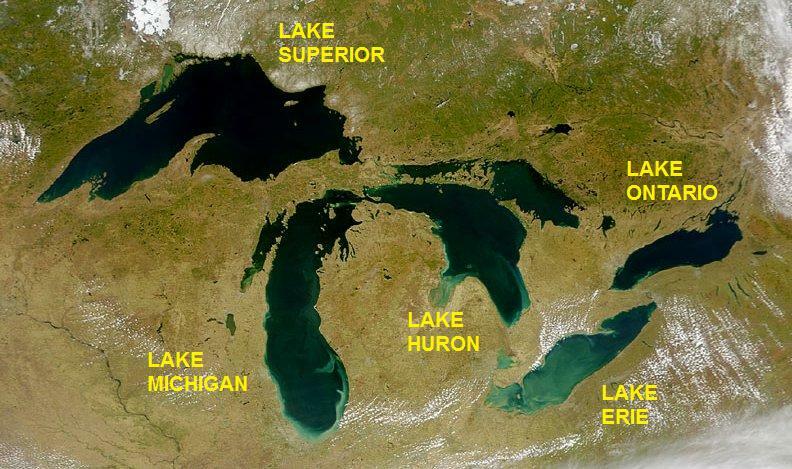 There is one more lake called Lake Ontario that Michigan does not border, and these lakes are called The Great Lakes. The Mackinac Bridge is a five mile long bridge that goes from the Lower Peninsula to the Upper Peninsula. There are many islands in the great lakes, but the biggest one is Isle Royale. It is 45 miles long of natural beauty, and has moose and wolves living on the island. Another big island in Michigan is Mackinac Island. It used to be a military base for ships to go to long ago, and now on the island they don't allow cars so people have to go everywhere by hiking and biking. 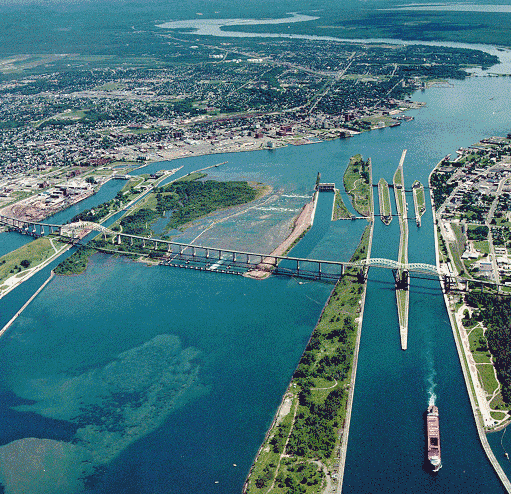 In the city of Sault Ste Marie (sounds like soo saint marie) the St. Mary's River connects Lake Huron to Lake Superior. so someone built a machine where the boats can go into something called a lock, wait for the water to lower them slowly down 21 feet, then go to the lower lake. On the coast of lake Michigan, there are many nice beaches, and some very large sand dunes. One of the biggest is called Warren Dunes, where there is a beach, campground and large sand dunes to climb. When Jesus was nailed to the cross he was put between two criminals. Crucifixion was one of the worst punishments for anyone, so even though Jesus was a good person he was punished with bad people. One of the criminals was not nice to him, said nasty things to him and said that if Jesus was really the Messiah he should save himself. The other criminal told the nasty one that he was wrong, and that while both the criminals were being punished for things they did wrong, Jesus hadn't done anything wrong. He asked Jesus to remember him in his kingdom. Because this man had faith in Jesus, even though he was a criminal Jesus said that the nice criminal would be with him in paradise that day. We just learned about the painting Relativity by M. C. Escher. Another famous work of art was called The Snail by French artist Henri Matisse. Matisse was very famous for many of the paintings that he did through his life, but one day he got sick and could not paint the same way anymore. He still wanted to make art, so instead of using a paintbrush he did something called decoupage which is like colored paper cut outs pasted together to make a picture. Matisse drew a picture of the snail, then took the colored paper and set them together to look kind of like a colorful snail. and they are excited is sie sind aufgeregt. and cirrocumulus clouds are up like small spread out cotton balls. Another type of cloud is called an altocumulus cloud, which looks puffy just like the other cumulus clouds, but it is larger and darker than the cirrocumulus clouds. Just like the altostratus cloud, the altocumulus is in the middle of the sky, not very high and not very low. We just learned about the Australian Cattle Dog. Another type of dog is the Basset Hound, sometimes also called a Hush Puppy. Long ago people used Basset Hounds as rabbit hunters. They have a great sense of smell and are one of the best smellers of any dog! Bassets are long heavy dogs with very short legs. They have long ears that hang down from their heads. Their ears are so long that basset hound puppies sometimes trip over their ears, and when the dogs are eating sometimes their ears get into their food. Because their ears hang down, they can help bring smells right to their nose so they can find things better. Most bassets have a white tip on their tail, which hunters would use to help find their dogs while the dogs were out looking for rabbits. We know that the subclavian artery brings oxygenated blood from the heart toward the arm, and then continues on to turn into the axillary artery. After that it goes down the arm between your biceps and triceps and is called the brachial artery.